The finale event of our festival, a Big Green Fair take over of the Stade Open Space, the Classroom on the Coast and the Stade Hall. 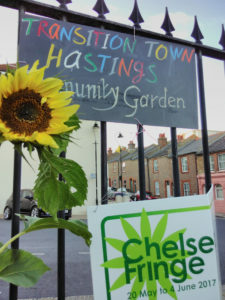 Bike Lab Hastings will be doing free bike checks, meet the Hastings Sustainable Transport Forum and find out how they are campaigning to improve transport in the town, The Greenway Group, Co-wheels car sharing scheme and see some electric vehicles! Meet Refill Hastings and learn where you can refill your water bottles for free in the town. Talk to Plastic Free Hastings about how we can reduce the amount of single use plastic that ends up o our beaches. Hastings Furniture Service – recycling, reusing and repairing household products and furniture. One Small Shop – Sustainable Lifestyle Store bringing you organic and ethically made skincare, clothing, accessories and homewares. Includes plastic free products. The OVESCO (Ouse Valley Energy Services Company) team will have generating bikes, information about ways to make electricity from sunlight, wind, flowing water as well as some unusual ways such as used on Mars, electrostatically, from bent crystals and from lemons (yes, lemons!). There will also be samples of the fossil fuels that are causing such trouble such as crude oil, tar sands and the oil shale that they want to frack 🙁 and facts about them. Our Power local energy tariff and Energise Sussex Coast will have information about how to save energy and money on your energy bills. Meet Divest East Sussex, a coalition of groups campaigning to divest the East Sussex Pension Fund from fossil fuels (oil, coal and gas). Pea Pod Veg and Eve Apple Press will be showing their sustainable food produce. Radical Routes network of housing co-ops, workers’ co-ops and social centres, with info about setting up housing co-ops and so on. We have a series of cooking and fermenting workshops at The Classroom on the Coast from Hastings Fermentery, Make Food (Hastings Harvest Class) and Hastings Food Hub. There will be yarn bombing, a knitted seaside scene, music, children’s workshops on seed planting and pompom making and more. 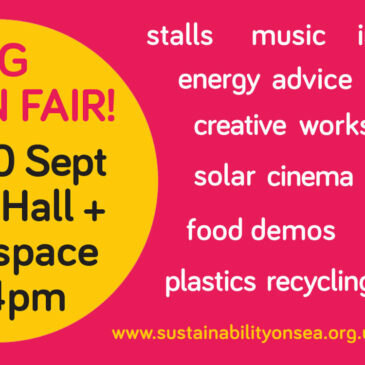 Drop by for our programme of talks and demos on composting, plastic recycling, sustainable housing, Alexander Technique, Transition Town movement and permaculture in the garden.